It’s time to make plans to attend the 2016 Toronto Railway Prototype Modellers meet! The details are below. If you are in the Greater Toronto Area and have a blog or website, I encourage you to share this information to get the word out. Click on the banner at the top of this post to visit the Toronto RPM blog, and be sure to contact organizer Brian Gauer (his email can be found on the blog) to let him know you plan to attend. 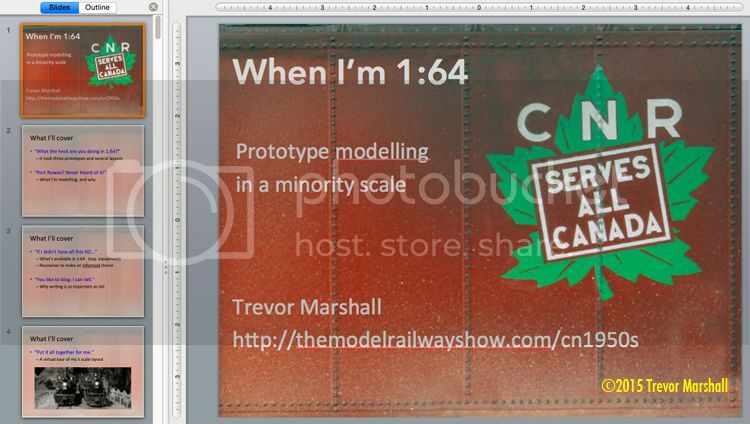 As the title slide suggests, this is a clinic about the opportunities and challenges of modelling a specific prototype in 1:64 – using my layout as an example. I’ll cover why I ended up in S scale, why I picked the Port Rowan branch and things to research and ponder to determine whether S is a viable scale in which to work. I’ll also explain why I write this blog and now consider it as essential to building a layout as having a good supply of ties and rail. And I’ll wrap up with a quick tour of the line – because everybody likes pretty pictures. All of this information is available in the 1000+ postings on this blog, for those who care to sift through it. But I’ve added some fresh photos – including several of earlier layouts in other scales and gauges. And, of course, I’ve boiled down the story to what I hope is an entertaining and informative 45 minutes. I’m looking forward to giving this presentation and I hope to see you at the Toronto RPM. This entry was posted in equipment, philosophy, prototype influence, resources, S in context by Trevor. Bookmark the permalink. I’d love to attend, even only if I get to see your presentation! I hope to see you there, Walker. Cheers! I’m hoping to make it again this year. I made it the first time 2 years ago, and it’s a pretty neat place to see some cool modelling and meet and greet like minded modelers. Well, I hope to see you there, Chris. Cheers!